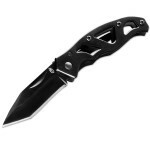 EDC or Everyday Carry knives are becoming very useful and essential nowadays. It is convenient to carry one as it offers endless purposes. Usually, it is used for opening boxes and envelopes, cutting zip ties and ropes, opening packages of food, opening cans and bottles, serving as a screwdriver, and even trimming clothes and fabric. Some people even use it to clean their fingernails and others use it as improvised toothpicks. While this may be very dangerous, the bottom line is that EDC knives are very useful. Therefore, you should be well aware of the things you need to consider in purchasing one so your money will not go down the drain. Choosing the best EDC knife means you have to make sure that it is 100% safe. This usually equates to a folding mechanism that is of high quality and efficiency. It should work smoothly. 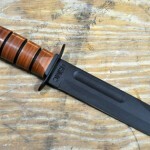 If you opt for a fixed blade, make sure that the sheath is durable. Another thing to consider is the weight of your knife. It may be more convenient to carry a light one but make sure that the quality is not sacrificed. You should also keep in mind that a good grip is necessary. Make sure it won’t slip out of your hands whether you are using the knife for a simple or emergency task. 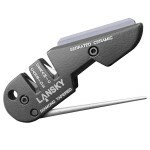 Finally, the most important aspect to consider is the sharpness of your EDC knife. A high quality one will keep its sharpness for a longer period of time than the other models. Some high quality steel materials are 8CR13MOV, VG-10, or 30V. Such types of steel allow easy handling and maintenance. Remember that all knives will get dull at some point due to frequent use. Therefore, you should learn the different types of knife sharpeners and find out which one is comfortable for you. Sharpening stones are also known as whetstones. They are the more popular types of EDC knife sharpeners. They are triangular in shape and usually an inch thick. Materials commonly used as whetstones are ceramic, diamond, or natural stones from Arkansas which could be used for sharpening. Most of the time, this type is effective even for dull knives as it can remove a lot from the blade. Also, sharpening stones are not only useful for knives. They may be used for other tools such as razors and scissors. As mentioned earlier, Arkansas Washita natural stones are commonly being used in knife sharpening. They contain genuine silica Novaculite. Aside from being highly effective sharpeners, these natural stones have the ability to renew themselves. This happens due to the stacked bubbles or honeycomb composition of the grits. You must be aware that this self-renewal process may take years, though. These natural stones may be used wet or dry and it is important to clean them after sharpening to ensure quality. You should also use honing fluid during sharpening to add to the effectiveness of this tool. Sharpening steel, on the other hand, can only be used for knives. However, it is not mainly used for sharpening. Instead, it is mostly used for EDC knife maintenance. Perhaps it would still be a good combination to use both a sharpening stone and sharpening steel. Sharpening steel is long and narrow in nature. It could be made of either ceramic or steel. As opposed to the sharpening stone, using sharpening steel does not take that much material from your knife. What it mainly does is to realign and deform the blade of your knife to how it used to be. It is recommended to use a sharpening steel before and after you have used your EDC knife. Then there are the knife hones. They work pretty much the same as sharpening steel. It mainly uses both steel and stone to maintain the original form of the EDC knife by not taking too much material from the blade. Knife hones are available in different sizes and shapes. There are also different designs. Some may have slots to polish and hone the blade of your knife while there are some that make use of a small sharpening stone where you can run your knife’s blade up and down. Moving on, there are the electric knife sharpeners. Usually, these look like rectangular boxes with slots where you can place your EDC knives. The mechanism works through a motorized wheel spinning inside the device. 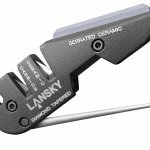 This assures you speed and convenience in knife sharpening. However, critics say that such tool gives you less control on the way you want your knives sharpened. Also, it is a bit bulkier compared to the other types of sharpeners. Electric knife sharpeners are mostly used for kitchen knives and they are rarely used for survival or tactical knives. There are also sharpeners called diamond sharpeners. They are usually made of composite or metal bases. The outer layer is made of diamonds that are micron-sized and are specially bonded to the metal of the sharpener through nickel plating. Typically, they have special surface holes that prevent the building up of fillings. 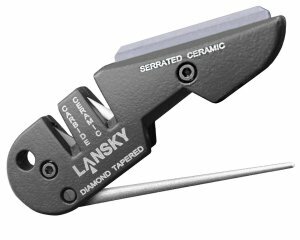 Generally, diamond sharpeners are known to be effective, fast, and less likely to cause depression in the surface of your EDC knife. To make sure that the quality of your diamond sharpener is preserved, clean its surface thoroughly after using it. With all the available methods of sharpening your EDC knife, you may feel free to choose which one is the most suitable for you. It would be wise to use a combination of tools from time to time and also make sure that you give proper maintenance to them, just like what you do with your EDC knife.